Blingcrete – Concrete. Light. Action! The Bling­C­re­te pro­ject be­gan as a se­ries of ar­tistic ex­pe­ri­ments with light-re­f­lec­ting ma­te­rials and the phe­no­me­non of re­tro­re­f­lec­ti­on. It is thus an ex­chan­ge in­i­tia­ted from the ar­tist’s po­si­ti­on, in which ways of kno­wing and wor­king that are spe­ci­fic to the sci­en­ces are har­nes­sed in or­der to po­si­ti­on and de­p­loy them in ar­tistic con­texts – and vice ver­sa. At the th­res­hold bet­we­en vi­si­bi­li­ty and in­vi­si­bi­li­ty, Bling­C­re­te re­veals the con­tra­dic­ti­ons of ma­te­rial re­p­re­sen­ta­ti­on. The re­se­arch pro­ject picks up that th­read, using such ob­ser­va­ti­ons to ge­ne­ra­te furt­her li­nes of in­quiry and re­con­cei­ve boun­da­ries. Bling­C­re­te re­p­res­ents a new gen­re of ma­te­rials with its own lo­gic of ef­fect that can­not be de­scri­bed sim­p­ly in terms of the usual ca­te­go­ries of hea­vy and light or form, con­struc­ti­on and sur­face. The ma­te­rial, al­so known as ligh­t­re­f­lec­ting con­c­re­te, com­bi­nes the po­si­ti­ve cha­rac­te­ristics of con­c­re­te (fi­re sa­fe­ty, so­li­di­ty, buil­ding me­thods) with tho­se of re­tro­re­f­lec­ti­on. Re­tro­re­f­lec­ting sur­faces send in­co­ming rays of light (sun­light or ar­ti­fi­cial light) back pre­ci­se­ly in the di­rec­ti­on of the sour­ce. This opti­cal phe­no­me­non is pro­du­ced by em­bed­ding glass mi­cros­phe­res in the sub­st­ra­te ma­te­rial. Cru­cial for the re­f­lec­ti­ve po­wer are the round­ness, cla­ri­ty and re­frac­ti­ve in­dex of the beads, as well as the bond bet­we­en the glass mi­cros­phe­res and the sub­st­ra­te. 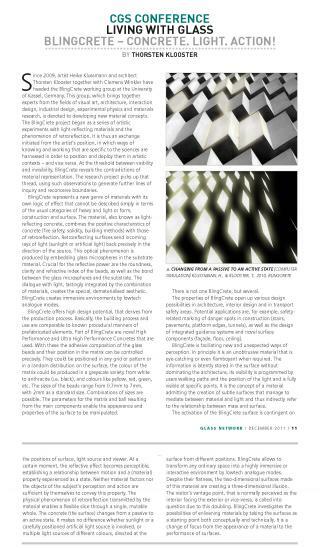 The dia­lo­gue with light, las­tin­g­ly in­te­g­ra­ted by the com­bi­na­ti­on of ma­te­rials, crea­tes the spe­cial, de­ma­te­ria­li­sed aes­thetic. Bling­C­re­te crea­tes im­mer­si­ve en­viron­ments by low­tech ana­lo­gue mo­des. Bling­C­re­te of­fers high de­sign po­ten­tial, that de­ri­ves from the pro­duc­ti­on pro­cess. Ba­si­cal­ly, the buil­ding pro­cess and use are com­pa­ra­b­le to known pro­ce­du­ral man­ners of pre­fa­bri­ca­ted ele­ments. Part of Bling­C­re­te are no­vel High Per­for­man­ce and Ul­t­ra High Per­for­man­ce Con­c­re­tes that are used. With the­se the ad­he­si­ve com­po­si­ti­on of the glass beads and their po­si­ti­on in the ma­trix can be con­trol­led pre­ci­se­ly. They could be po­si­tio­ned in any grid or pat­tern or in a ran­dom di­s­tri­bu­ti­on on the sur­face, the co­lour of the ma­trix could be pro­du­ced in a grey­s­ca­le va­rie­ty from whi­te to an­thr­a­ci­te (i.e. black), and co­lours li­ke yel­low, red, gre­en, etc. The si­zes of the beads ran­ge from 0.7mm to 7mm, with 4 mm as a stan­dard si­ze. Com­bi­na­ti­ons of si­zes are pos­si­b­le. The pa­ra­me­ters for the ma­trix and ball re­sul­ting from the main com­pon­ents enab­le the ap­pearan­ce and pro­per­ties of the sur­face to be ma­ni­pu­la­ted. The­re is not one Bling­C­re­te, but se­veral. The pro­per­ties of Bling­C­re­te open up va­rious de­sign pos­si­bi­li­ties in ar­chi­tec­tu­re, in­te­rior de­sign and in trans­port sa­fe­ty areas. Po­ten­tial ap­p­li­ca­ti­ons are, for examp­le, sa­fe­ty­re­la­ted mar­king of dan­ger spots in con­struc­ti­on (stairs, pa­ve­ments, plat­form ed­ges, tun­nels), as well as the de­sign of in­te­g­ra­ted gui­dan­ce sys­tems and no­vel sur­face com­pon­ents (fa­ça­de, floor, ce­i­ling). Bling­C­re­te is fa­ci­lia­ting new and un­ex­pec­ted ways of per­cep­ti­on. In prin­cip­le it is an un­ob­tru­si­ve ma­te­rial that is eye-cat­ching or even flam­boyant when re­qui­red. The in­for­ma­ti­on is la­tent­ly sto­red in the sur­face wi­t­hout do­mi­na­ting the ar­chi­tec­tu­re, its vi­si­bi­li­ty is pro­gram­med by users wal­king paths and the po­si­ti­on of the light and is ful­ly vi­si­b­le at spe­ci­fic po­ints. It is the con­cept of a ma­te­rial ad­mit­ting the crea­ti­on of subt­le sur­faces that ma­na­ge to me­dia­te bet­we­en ma­te­rial and light and thus in­di­rect­ly re­fer to the re­la­ti­onship bet­we­en mass and sur­face. The ac­ti­va­ti­on of the Bling­C­re­te sur­face is con­tin­gent on the po­si­ti­ons of sur­face, light sour­ce and vie­w­er. At a cer­tain mo­ment, the re­f­lec­ti­ve ef­fect be­co­mes per­cep­ti­b­le, es­tab­lis­hing a re­la­ti­onship bet­we­en mo­ti­on and a (ma­te­rial) pro­per­ty ex­pe­ri­en­ced as a sta­te. Neit­her ma­te­rial fac­tors nor the ob­jects of the sub­ject’s per­cep­ti­on and ac­ti­on are suf­fi­ci­ent by them­sel­ves to con­vey this pro­per­ty. The phy­si­cal phe­no­me­non of re­tro­re­f­lec­ti­on trans­mit­ted by the ma­te­rial enab­les a fle­xi­b­le sli­ce th­rough a sing­le, mu­ta­b­le who­le. The con­c­re­te (the sur­face) chan­ges from a pas­si­ve to an ac­ti­ve sta­te. It ma­kes no dif­fe­ren­ce whe­ther sun­light or a ca­re­ful­ly po­si­tio­ned ar­ti­fi­cial light sour­ce is in­vol­ved, or mul­tip­le light sour­ces of dif­fe­rent co­lours, di­rec­ted at the sur­face from dif­fe­rent po­si­ti­ons. Bling­C­re­te al­lows to trans­form any or­di­na­ry space in­to a high­ly im­mer­si­ve or in­ter­ac­ti­ve en­viron­ment by low­tech ana­lo­gue mo­des. De­spi­te their flat­ness, the two-di­men­sio­nal sur­faces ma­de of this ma­te­rial are crea­ting a th­ree-di­men­sio­nal il­lu­si­on. The vi­si­tor’s van­ta­ge po­int, that is nor­mal­ly per­cei­ved as the in­te­rior fa­cing the ex­te­rior or vice-ver­sa, is cal­led in­to qu­es­ti­on due to this dou­b­ling. Bling­C­re­te in­ves­ti­ga­tes the pos­si­bi­li­ties of en­li­ve­ning ma­te­rials by ta­king the sur­faces as a st­ar­ting po­int both con­cep­tual­ly and tech­ni­cal­ly. It is a chan­ge of fo­cus from the ap­pearan­ce of a ma­te­rial to the per­for­man­ce of sur­faces.